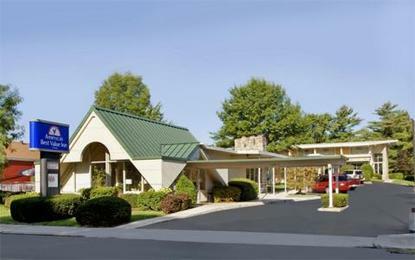 The Americas Best Value Inn Gettysburg is centrally located in historic Gettysburg, Pennsylvania. We are located within walking distance from the battlefield of Gettysburg, The Civil War Museum, Gettysburg National Cemetery, and other historic attractions. From the Americas Best Value Inn you can leave your car and walk to parks, museums and over a dozen restaurants. We are also conveniently close to shopping, golf, ski areas, and special events that take place year around. We have a crystal clear outdoor swimming pool, and we offer many amenities at affordable family rates. Relax in one of our spacious guest rooms, with complimentary high-speed Internet, in-room hairdryers, iron with ironing boards, and satellite TV. We also offer microwaves and refrigerators in selected rooms. A complimentary deluxe continental breakfast is served daily. Our courteous staff is available to you 24 hours a day. We look forward to making your stay a memorable and enjoyable experience. . We now feature a Hot Tub, which seats 6-8 adults. . Gettysburg is America*s most famous small town. In 1863 the 3 day Battle of Gettysburg involved 170,000 Americans and saved the nation. Today the land is a 6,000 acre National Park with over 1,300 monuments along 32 miles of scenic avenues. Abraham Lincoln delivered one of the world*s most famous speeches here at the the Gettysburg National Cemetery. President Dwight D. Eisenhower made Gettysburg his home. Must see area attractions include the Civil War Museum, the Eisenhower Tour, the National Cemetery, the Lincoln Train Museum, the Battlefield, the Battle Theater, the American Civil War Wax Museum, the Hall of Presidents, the Soldier*s National Museum, Ghosts of Gettysburg, Gettysburg College, Boyd*s Bear Country, the Cherry-Crest Farm, Hevener Farms, and many others. Gettysburg is more than just a battlefield however, the town is surrounded by quaint, picturesque farmlands which create a peaceful and relaxing retreat. Many people stay several days in Gettysburg and make day trips to Baltimore, Lancaster, Hershey and Washington DC. Visiting Gettysburg is truly a remarkable and meaningful experience. .